We kicked off our latest Movie Class by watching what the kids had done last time, seeing their pictures with dialogue. I wanted them to watch their films carefully, but also pay close attention to their friends’ movies too. 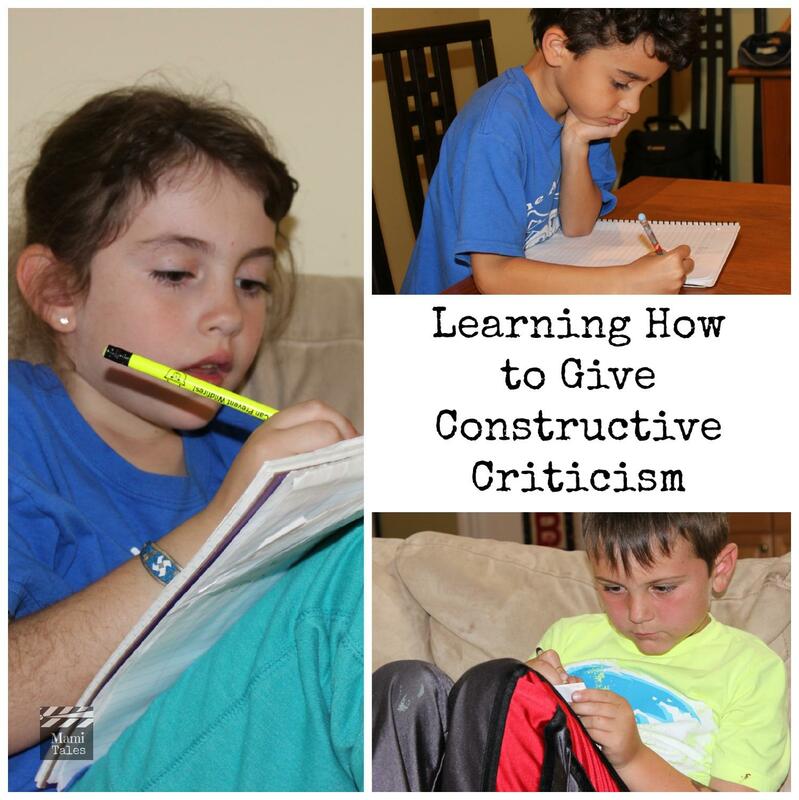 I wanted to teach them how important it is to know how to give, and receive, criticism. Before we went to watch their projects, I explained to them we were going to watch everything twice. Once without any sort of interruption, and then again, but stopping at the end of each short to write down their thoughts on 3 things they would do differently to make each story or movie better. I said that saying “I liked it” or “I didn’t like it” were not things I was interested in hearing, but if they didn’t understand something, or didn’t like something, to put their little noggins at work and come up with solutions on how to do things differently. Basically, I asked them to make sure that if they had a comment, it was something well thought out with ideas to help the creator of the project, not bring him/her down. That, in a nutshell, is what constructive criticism is. Critiques on Green Girl, by I.K. After doing a lottery for establishing the order in which we were going to see the shorts and do the critiques, we began with Miss I’s Green Girl. Here’s the movie again. Here are the comments the kids have on it in BOLD, with my response and what we talked about following each point in regular script. How can anybody walk? This was a question to try and understand how they would make their figures look like moving, instead of just having still photography with voices. We’ll address this later on, when they are ready to do their final films. I told them it won’t be seamless movement, as we don’t have the capability or time to do that type of animation, but we can make it look better. Slime should be cleaned up. This is a very important point, as Green Girl is supposed to be an ecological super hero… she should never leave a green slimy mess. I don’t know what the Villains did. This is also a crucial thing to make this story work: in the film it is not very clear what the villains were doing and what prompted Green Girl to fight them. For a super hero movie, that is key. I would make the slime orange. When I asked why he had written this down, J.H. said that’s because orange is his favorite color. That gave us a chance to talk about criticism, and how a comment like that was not really helping the story in any way. If anything, green is the best color for the slime as it comes from Green Girl, not Orange girl. Which is more important is understanding the purpose of the slime, and what the slime Green Girl and Green Guy shoot actually does. I would make it faster. I took this to mean that the visuals of the story were a little slow, as well as too much dialogue that was not giving us much context or action that would aide the rest of the story. He said that yes, at the beginning it was all too slow. And make it slow at the end… This comment left me a little perplexed, as it came from the same person. I asked why he wrote that and what he meant, and he responded that he couldn’t think of a third thing to write, so he just said that. Right then and there I stopped them and said that was just the behavior I was trying to avoid… that is exactly the opposite of constructive criticism, as it just confuses the person who is receiving the comment. If other people have the good will and put in the time to watch your stuff and give you their comments, it’s just fair to put in the work to make sure your comments are constructive and useful too. I think I would change the Villains throwing trash on Green Girl. This was Miss I’s idea after watching her film with a more critical eye. If the Villains actively throw trash on Green Girl or Green Guy, then she can do an action in return… which is conflict in action, showing what the problem is, instead of telling about it, and creating a reaction from our main character. The Green Slime should turn into recycle slime. This is also good, because now she’s thinking on how to give Green Girl super powers that are actually… Green. The Villains should pick up their litter in the end. This is also a good change in that story, as it give it an end. A bit of a moralistic end, but that’s what super hero movies tend to be about. Critiques on Bad Guys Beware, by J.H. I would show the knife [when the bad guy breaks away] This is purely visual film language. We need a Close Up of the knife to understand details just like that. From a long shot, we’ll never be clued in on what is going on. I’d put a light bulb on both heads. This is to mean that when the bad guy has an idea on how to break free, he should also have an idea light bulb on top of his head. I’d use Legos instead. That comment to me was a bit of a mystery, so I asked Miss I to elaborate… and she said that she was confused on who was the good guy and who was the bad guy. With Legos it would have been easier for her to identify them and follow the story. I didn’t see him [the Bad Guy] chasing him [the Good Guy]. At the end, once the Bad Guy escapes, the reversal of roles and the ensuing chase is not clear at all. It looks like a light bulb. I let them all know that saying something like this doesn’t count as criticism. Questions on things they don’t understand, for the creator of the story to understand what works and what doesn’t, are allowed. But blank statements such as this one are not constructive or helpful. Why use the light bulb on his head? I told J.S. that it wasn’t fair that he had used two of his comments to address the same thing… but this time around, it was much more clear what he meant by drawing attention to the light bulb. I guess J.H. has to bear in mind that not everyone universally catches the light bulb as an indication of an idea. I would change the size of the electric net. This is a good specific thing that can be done to make this story more understandable for the viewer. Once the net looks more like a net and covers up the bad guy, it might also be easier to figure out how to break free from it and escape. I’ll make the light bulb red. I told him I don’t see how the story would be helped or more clear by this change, but he can try it out. I would make the toys Action Figures. This also was addressing the fact that the Good Guy and the Bad Guy are not clear to us as an audience. So I think this change would benefit the telling of his story. Critiques on Word World, by J.S. I would show them cleaning the field. This was a major point we were all discussing. Miss I said the same. Even J.S. wrote it as part of his notes.There’s a problem that is preventing the three friends from playing, but we never see what they do to solve it. It happens off camera. Show the Football game. Again, the whole point of the story is that the 3 friends want to play ball… and in the end the ball game also happens off camera. That was also one of Miss I’s comments, as well as J.S’. Make it more 3D. This one had me at a loss of words. I have no idea what he meant, and he had a very hard time explaining. It turned out to be again one of those empty comments to use up one of the things he had to say, and we again agreed that such comments are not allowed, as they just confuse. I would give them longer shots. Miss I also thought that having Close Ups of all the characters and cutting away at every single line they said looked very choppy and didn’t give her space to see where they were and what they were doing. This was a good comment, as it was addressing the visual aspects of storytelling. In the end, they were all a lot more clear on what was working and what wasn’t from their stories… and what to do to solve some of the problems they had. And more importantly, thanks to learning about giving Constructive Criticism, they had more tools and ideas to play around with. The biggest shock of the day came when I told them that next week, they’ll get to write someone else’s stories… taking in consideration everything that was said in this class. That means that Miss I’s going to write Word World, J.H. will write Green Girl, and J.S. will give Bad Guys Beware a try. It should be interesting to see how they feel and what they do when they step out of their comfort zone. HOLY MOLY!!!! These videos are amazing!! I know, I know, I’m missing the point of criticism, but I’m seriously FLOORED by their creativity and professionalism!!!!! Jacqui, you’re super sweet! They’ll be really happy to know their stories caused such a reaction! I can’t wait to share with everyone the finished projects once we’re done doing all the adjustments!